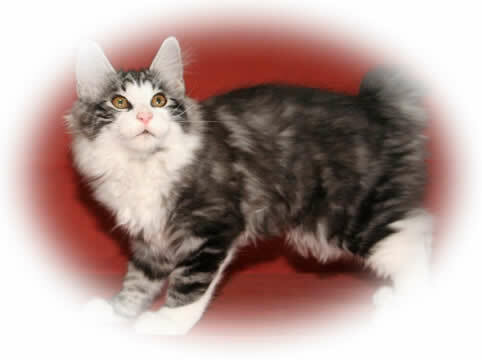 The Kurilian Bobtail is a cat which originates from the Kuril Islands between Russia and Japan, and Sakhalin Island and the Kamchatka peninsula of Russia. The original short haired Kurilian is a natural breed, known on the islands for over 200 years. As pets they are popular in Russia and the Far East of Europe and now we bring them to the UK!! The breed is mostly known for its distinctive "pom-pom" kinked, short tail, medium to large, substantially muscular, semi-cobby body, with longer hind legs than fronts, and a rounded, broad, wedge shaped head.Kurilians are not limited to any particular range of coat or eye colours. Kurilians come in all colours and eye colour is not related to coat colour. However, white cats should have either blue or odd eyes. Short or long haired, its most important feature is its fluffy tail with its twists and turns and short length. The back is slightly arched, with hind legs longer than the fronts, similar to the Manx and Cymric cats of the Isle of Man. It does not however suffer from the health issues that affect the Manx, infact the breed is extremely healthy and long lived. The variety is mostly known for its distinctive “pom-pom” kinked, short tail, medium to large, substantial, semi-cobby body, with longer hind legs that front, and a rounded-rectangular, wide face.